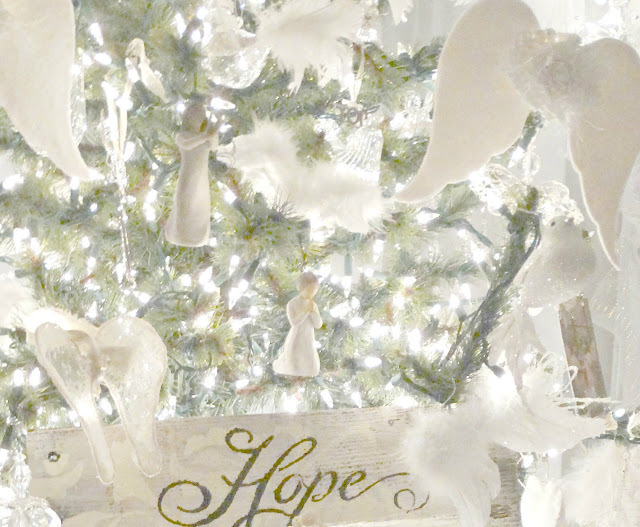 For my holiday decor this year I am doing a very serene and white theme. 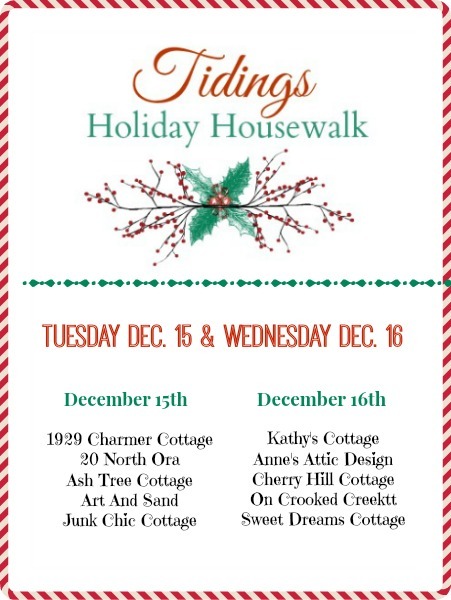 I will be on the Tidings Holiday House Walk this coming week Tuesday. I hope you will come by and see my decor and the others on this home tour. So many pretty inspiration homes to see. In the meantime I wanted to show you the angels that have gathered recently in my home from real life angels in blog land. I got these beautiful angels to add to my decor and tree this year. It was a couple of really happy mail days! Love these beautiful and meaningful angels that were gifted to me. I know I have said this many times but it is soooo true. There are the best peeps and friends in blog land. The Christmas Angels Gather Here sign was given to me by my bff Sandy at my girlfriend party. Love it in my angel tree. Thank you Sandy. This special angel was gifted to me by Diana from Nana Diana Takes A Break. Diana sewed this beautiful keep sake angel for me. 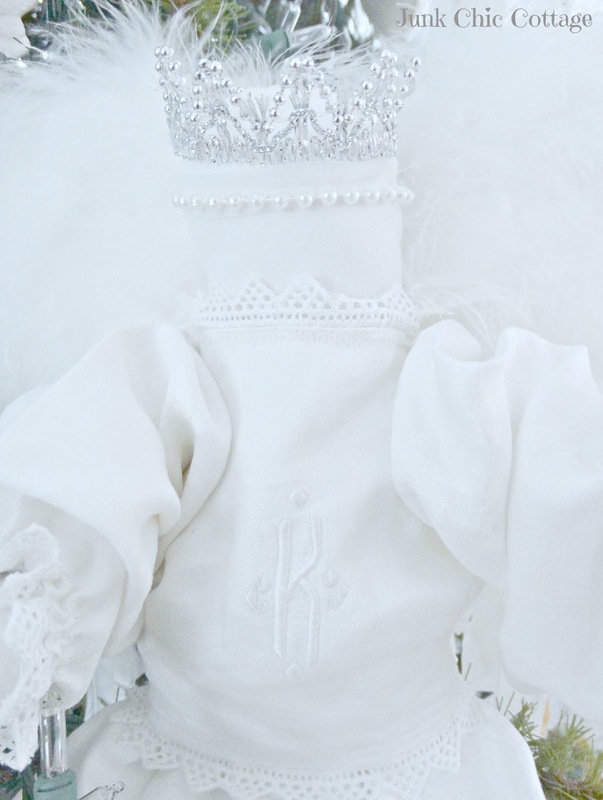 It is made out of pieces of linen that was her grandmothers. The K monogram on the linen she used was from a set of napkins that belonged to her grandmother. Her last name beginning with the letter K. It is also my initial for my first name so this was a special touch. I will treasure this sweet angel. Diana and I have become close friends and I love that she made this for me. Speaking of angels. Diana is such a wonderful angel to so many in blogland. Diana is always doing prayer requests and featuring others in helpful ways through her blog. Just recently her hero got diagnosed with Cancer and they are in the investigative stage right now. Please take a minute in your day today and say a prayer or send out a good thought for her hero and their family. This is a scary time for all of them. 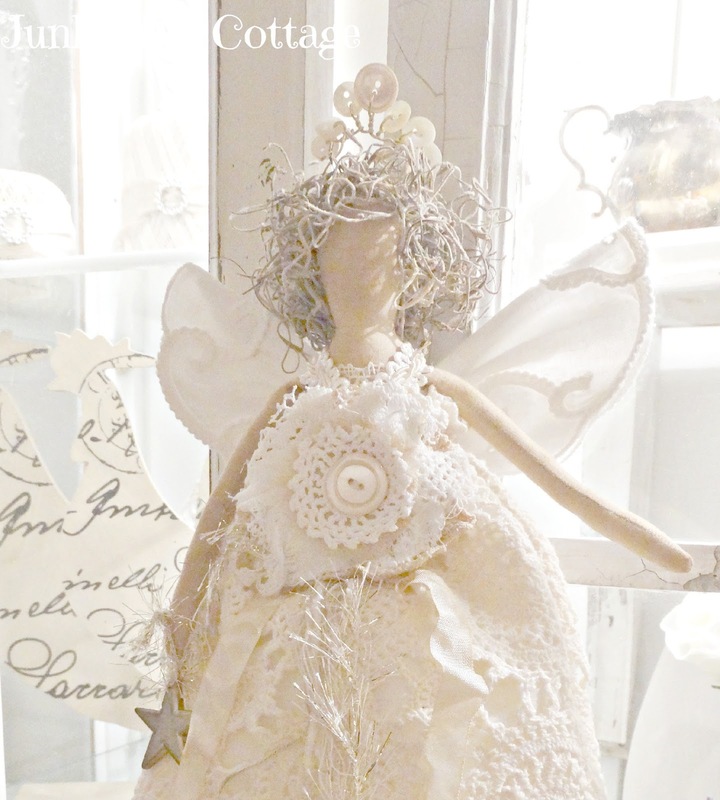 This pretty Angel I got from Pattie at her Etsy Shop Tattered Treasures. 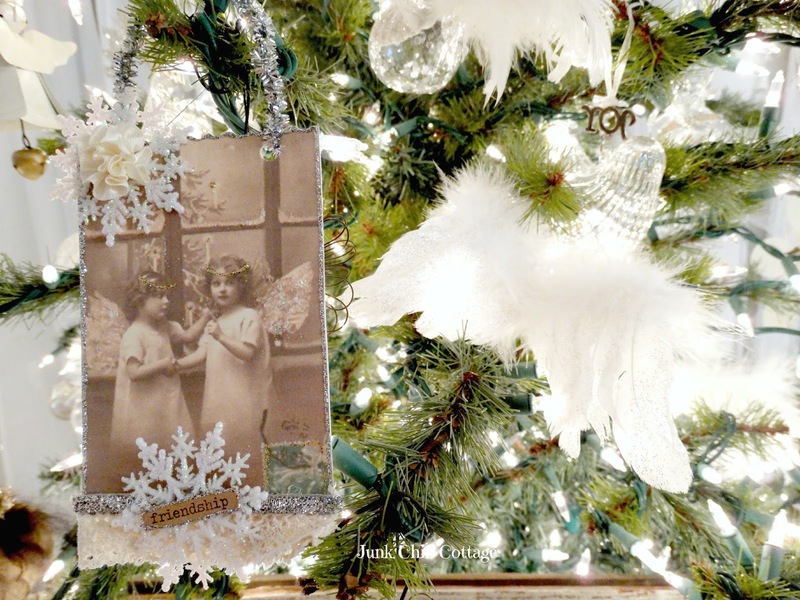 Pattie also has a wonderful blog with the same name Tattered Treasures. I had one made for me and for my girlfriend that collects angels. They are soooooo pretty. Love the detail that Pattie uses on these wonderful angels. Look at her sweet crown made out of vintage buttons. 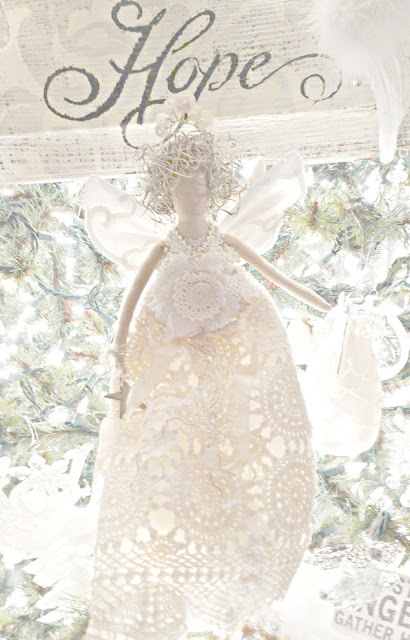 My new hope angel from Pattie hangs beautifully with all my other angels collected in my Christmas tree. Also purchased from Pattie are these beautiful angel wing ornaments. Loved these too. So in my cart on her Etsy site they went! 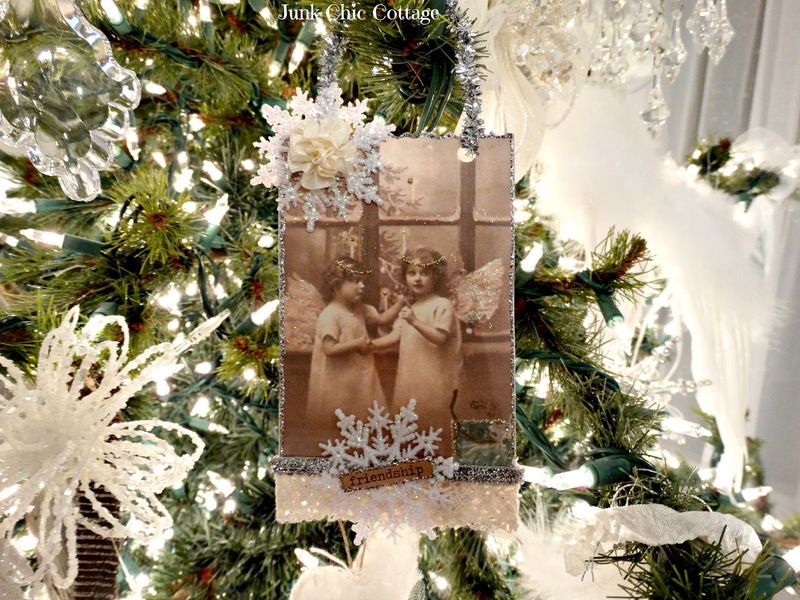 Thank you Pattie these angel wing ornaments will be treasured. Love these new additions from you for my tree this year. 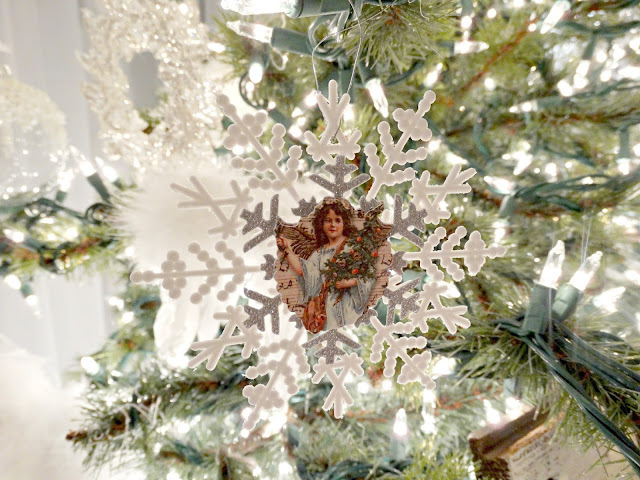 Deb from Garage Sale Gal blog sent me this cute angel ornament for my tree too. 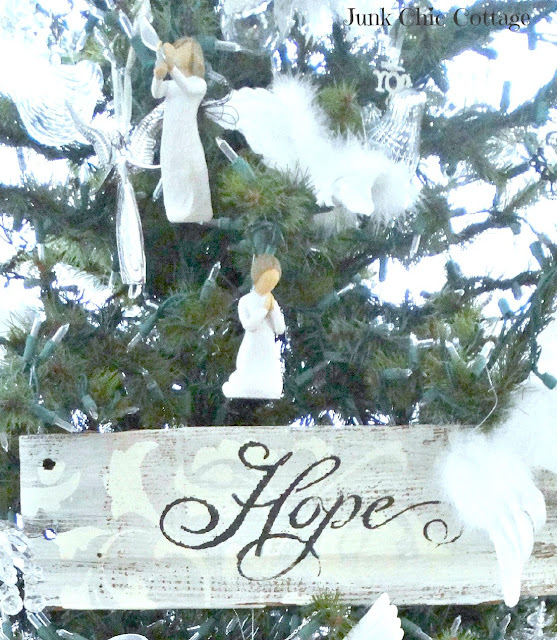 The angels above the Hope sign were also gifted to me recently. The prayer angel was from Vera from Row Homes and Cobblestones and the other Willow Tree Hope Angel ornament is from Diana. Both of these sweet angels were gifted to me at a time when I needed hope and prayer so they were a perfect addition for my collection. Celeste from Southern Day Dreams blog gifted me this sweet friendship angel ornament she made. If you have not been to Celeste's blog or Shop please go by and see all her beautiful creations. Thank you Celeste. I love this special angel to add to my tree. This beautiful angel wind chime was gifted to me from Cindy at Consider it all Joy. I hung it from my chandelier in the dining room. Love the sweet sound this chime makes. There are so many angels among us and Blogland is not only a great place for inspiration but also for friendship. Just wanted to say thank you in this post for my new angel editions. Please come back on Tuesday to see my holiday home decor and all the other inspirational home tours. Have a great week as we slide on down to Santa's big day! 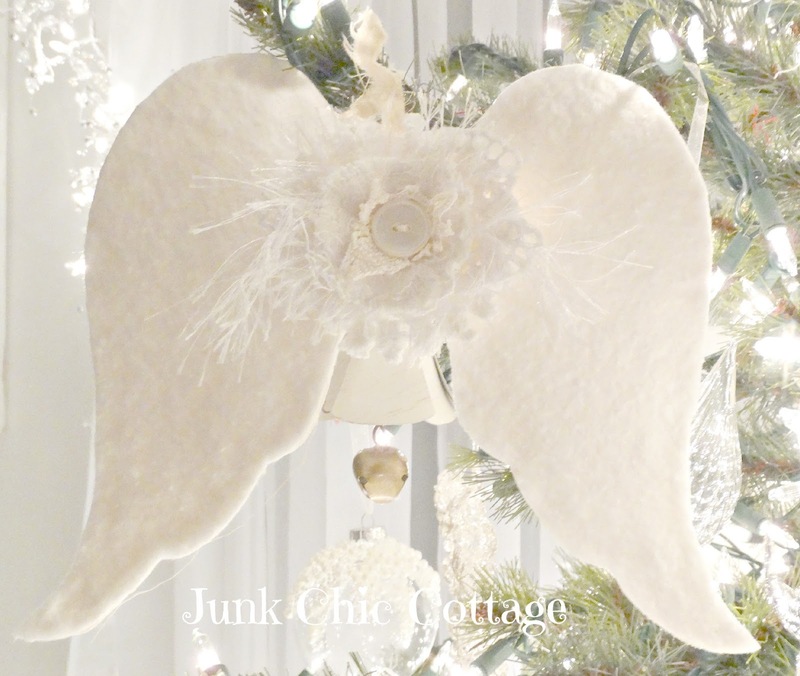 Wonderful to see "cottage style" blogs doing a link up Kris. Can't wait to see all the beautiful homes. Thank you for stopping by and visiting with me. I have been so busy my blog has been the last thing to get any attention, I will have more time soon and will get back on track. Merry Christmas to you and yours. 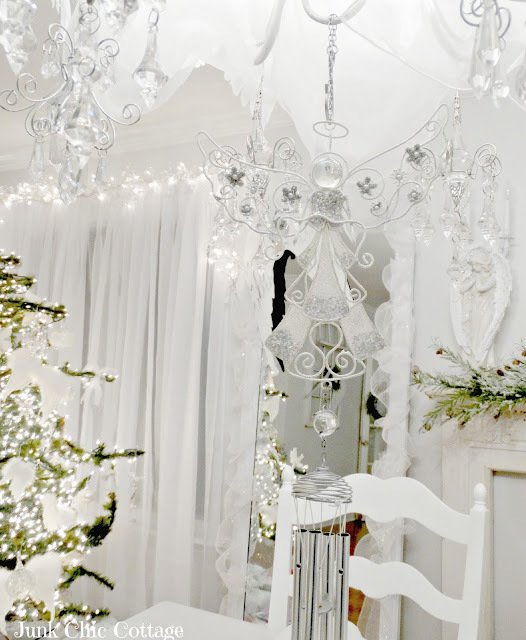 Kris, angels are definitely among us, and I love their symbolism with all yours throughout your Christmas decor. Your message for Diana's family is the second post I've read on her behalf today. I am certainly keeping her in my thoughts and prayers, and by spreading the word through blogging, I think her network of angels will certainly be called to action with a power of loving and giving readers and friends! Aw, what a wonderful collection. They are just adorable. You do have to give your secret for adding all the lights to your tree, I noticed they cover every branch. Beautiful decorations, Kris ~ all the more beautiful as they are from angel friends! Kris, Your angel tree is gorgeous!!! Your photos are all so beautiful!! 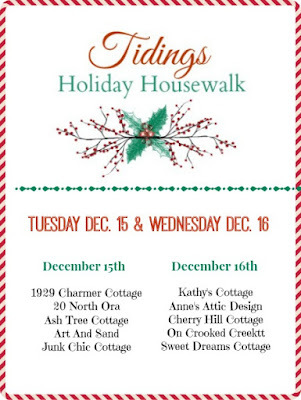 Thank You for mentioning my blog and Etsy shop.Oooh I can't wait for the holiday housewalk tours!! !I'm so excited!!!! nothing like shabby cottage tours!!!! Oh, all the angels are lovely. I don't have any angels so I need to find a special one this Christmas. Thanks for the mention my sweet Earth Angel friend. So many in Blog Land adore you. I appreciate your genuine kindness as it graces me throughout my days. Your angel theme is beautiful and so are you. What wonderful angels....each one beautiful in their own way. Great peeps you've got! Diana has always been such a sweetheart, and now this happens right at the holidays. Wow Kris, you received such beautiful angels. I love them all and hope you have a wonderful week. You have so many beautiful angels to remind you of all your dear friends who love you and care about you! Oh my goodness Kris, angels are everywhere! I love them and how special that so many were gifts. Blog friends are really special and I'm so glad that I'm a part of this wonderful Blogland. I sent Diana a message. I am so sorry about her "Hero." There were so many prayer messages to her that I hope it helps to lighten her burden. Such beautiful gifts from your dear friends Kris, and I can't imagine anyone more deserving. Hi Kris, what a special post filled with angel gifts, and so very deserving. 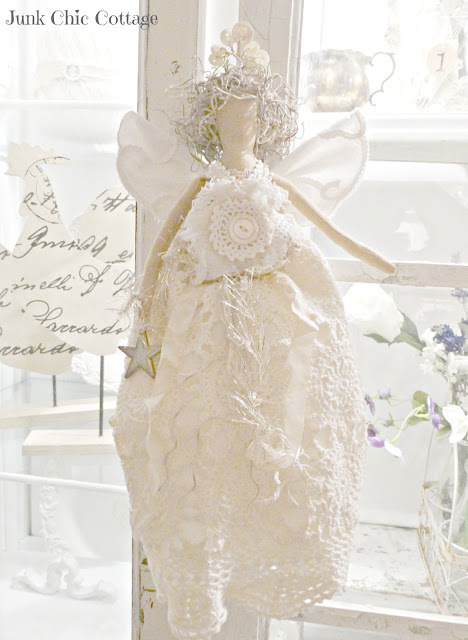 Love the gorgeous sewn angel Diana made for you. It is a treasure and so beautiful along with all the pretties from special blog friends. You've been blessed with special gifts and thank you for the mention as well. So kind of you. Your tree is so pretty. We are praying for Diana's Hero continually. The power of prayers are great and will make a difference!! They are all beautiful angels but I do believe Patty's is my favorite; not sure why, it tugged at my heart strings. It all looks so beautiful and ethereal. You have some sweet blogland friends. I will be saying some prayers for Diana. I'll be back on Tuesday to see more beauty. Kris - I cannot think of a more beautiful way to share the joy of the holidays than with angels. Yours are truly magical and so touching. Your message is filled with kindness and thank you for the beautiful post. Good morning dearest Kris! I heard about Diana's hero, and started to pray for him. I will do that again this morning on my long drive to work. The white whisps of angelic design are just gorgeous. I prefer the white décor of the season that promotes wonder, silence and imagination. Your angels are soooooo beautiful. Hugs to you dear Kris! All those white decorations look so beautiful. My co worker at http://paperwriting.xyz/ liked angels the most. He said they are looking really amazing! What a lovely collection of angels. I too am praying for Diana and her Hero. I'm reading your post with my morning coffee. Thank you so much for creating and sharing such a beautiful angel tree. It's truly a magical sight! 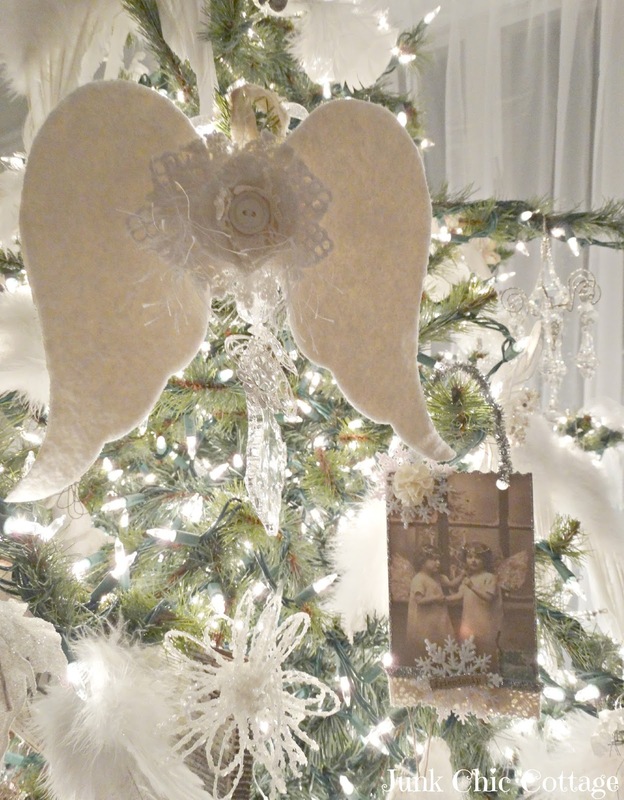 I just love your Angel tree! They are all just beautiful and the one Diana made is gorgeous, what a special gift! Hi Kris, you are truly loved in blog land and you have touched so many hearts with your kind words and actions. What wonderful keepsakes you have gotten. I can't wait to see your Christmas home. Oh my goodness, such beautiful angels! I adore the windchime angel especially. Thanks for sharing the additions to your collection with us Kris. Merry Christmas! Love the angels. I have been praying for Diana's hubby and will continue. such a beautiful angel und so wunderful wings! Very nice! you have so many pretty angels with sweet stories behind them! I hope they are bringing you good luck during this holiday season. Those are all so nice to have been gifted to you by special friends. You have a beautiful collection of angels! Love those angel wings! All so beautiful Kris...what an awesome collection! Looking forward to the home tour...can't wait to see it all! Hugs!! Your angel tree is just beautiful Kris! That wind chime is amazing! I'm saying prayers for Diana and her hero. Oh my gosh, it's all so beautiful!! Breathtaking really...those wings, gasp! Love it all!! I love those beautiful Angels! I am keeping Diana and her husband in my prayers. Kris, this is beautiful! I love the angel wings. They are all just stunning...so so pretty. Beautiful angels indeed! And I will send prayers in behalf of your dear friend Diana and her hero! I love your post today, beautiful. Beautiful angels from beautiful friends. And they were all sent to another lovely angel - YOU! Looking forward to your tour tomorrow, Kris! I can't even imagine what Diana is going through and I'm praying for her. Your tree is beautiful, Kris, and very etherial. Friends in Blogland are so precious, I can't believe I ever left all those years ago. What sweet treasures. Beautiful Kris! Your decor never disappoints my friend. Hi Kris, your angels would be a given on a tree of many in your home. Angels surround you, and you being the most inportant Angel of the bunch here. I bet in the quiet you can hear them all sing the beauty of Christmas. 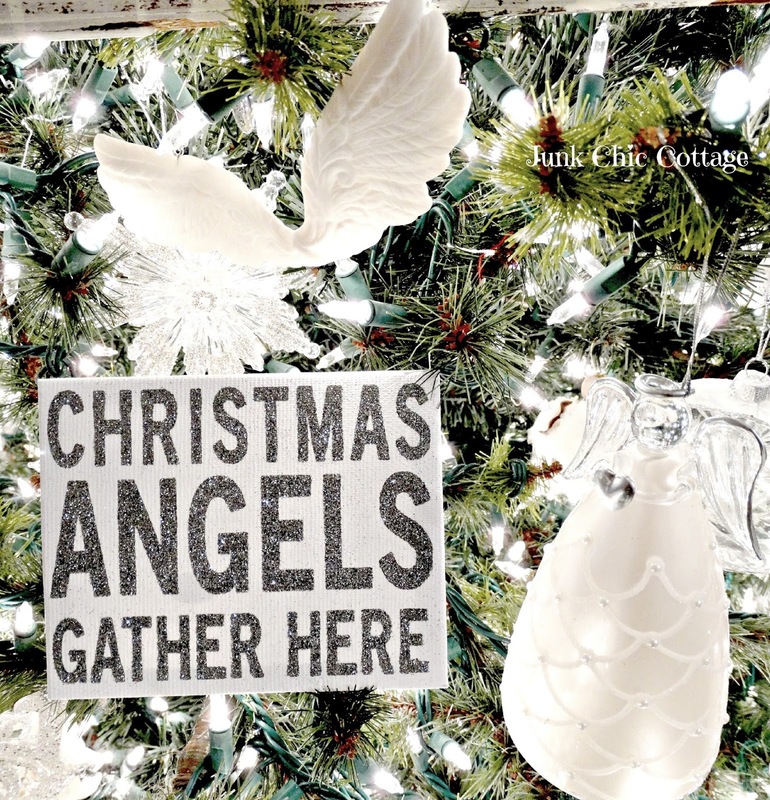 Your beautiful work is never done, doing for others, spot lighting bloggers so we better know the sweet blogging friendships we gain in blog land and if I could hang you on a tree of yours you would be the angel tree topper. Looking forward to the NEW YEAR, and all the encouragement, beauty, and inspiration you bring. Blessings to you and yours this Christmas holiday. Walking in faith and prayer that Diana will hear nothing but good news for her Husband. Beautiful, beautiful, beautiful! Kris your home has such an ethereal quality with the white. You've made me suddenly think that I need an angel tree because yours is so amazing. I hope your last Christmas in your house is very special for you. Everything is beautiful Kris. You did an outstanding job on your decorations. Thank you so much for sharing your beautiful home with us. 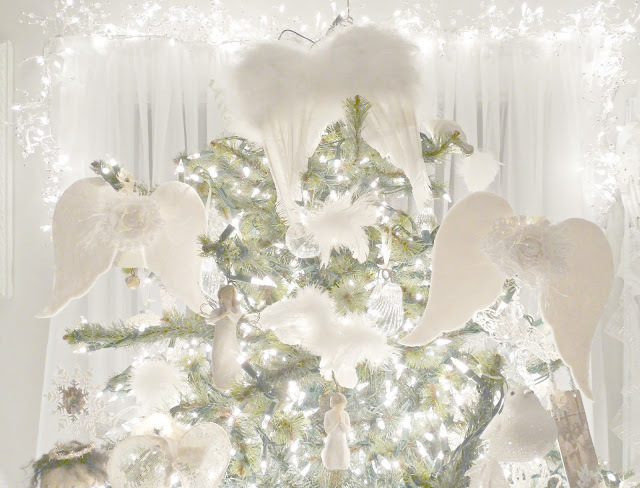 I can truly hear the angels sing...Love your tree of angel wings....the best! Can Comcast put cable/internet in any room? 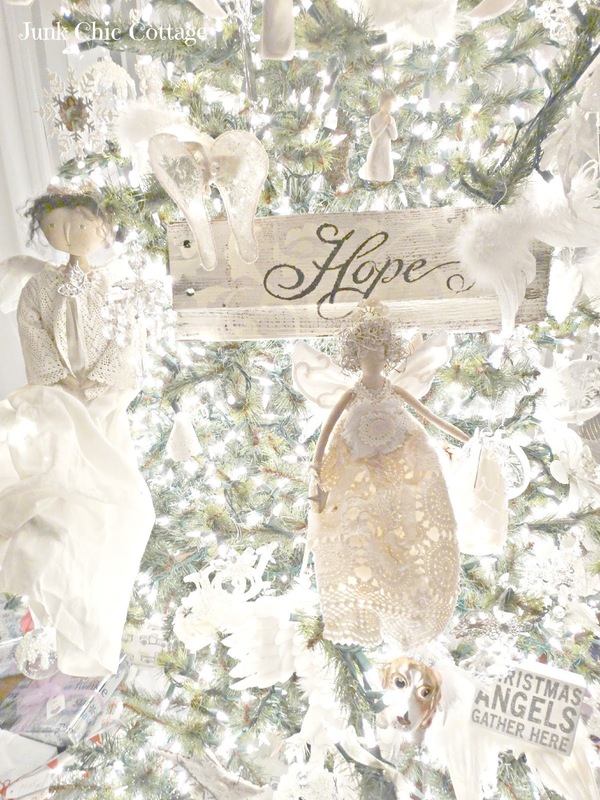 Kris, your angel tree is absolutely gorgeous! 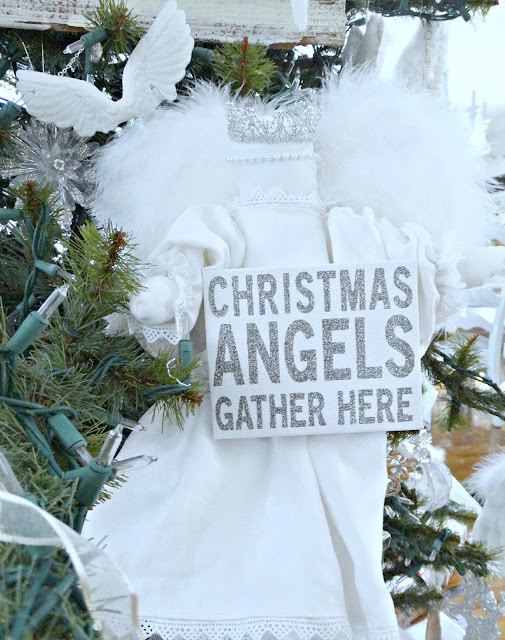 So many special angel gifts for an "angel". I used to collect angels and somehow, along the way, I stopped. Thank you so much for sharing this beauty with us! I've had Diana and her family in my prayers since this began. I do know there is great power in collective prayer. 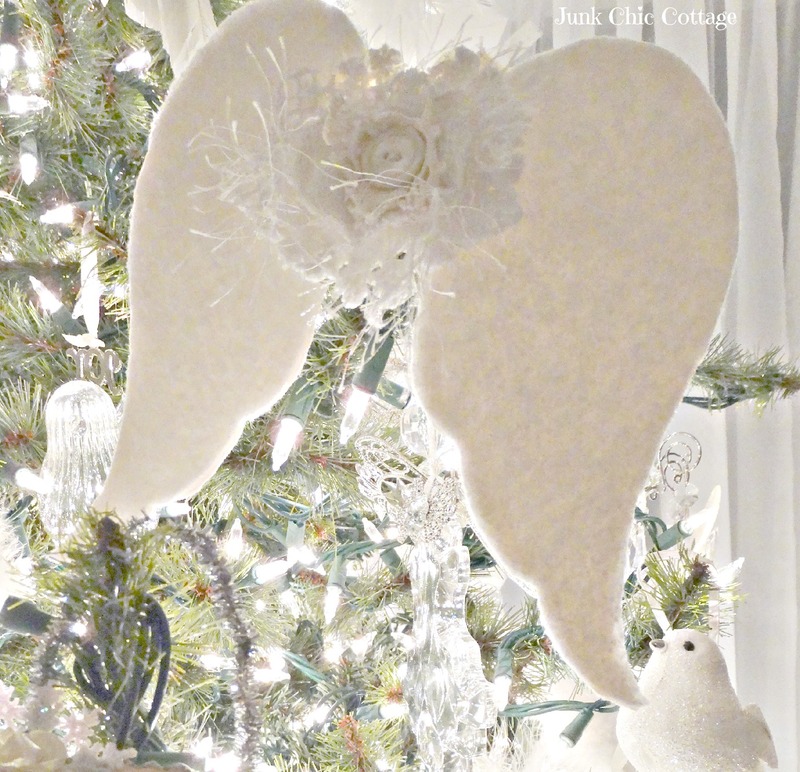 Your angels are absolutely wonderful and I love your idea to create a serene decor. I'll keep Diana and her family in my thoughts. Have a peaceful holiday season. Good idea!! It's so lovely!!! !